Works great and fits perfect in wallet. This is the best travel comb, and dishwasher safe. I use alot of product and it nice when you what is washed you can just throw it in the dishwasher. Santa came to visit last Christmas and gave one of these to everyone. My teens (guys) I figured would either love them or hate them since it would be one more thing for them to carry around...and the love was immediate. I see them use them all the time. My other son and his wife loved theirs, too. I keep mine in my purse...so thin, it adds no bulk and no weight, and I can't tell you how many times I have used it. I keep it in a specific pocket so it is easy for me to find and my sons love that it fits in their wallets. Comes in handy on windy days or when you just want to freshen up. My biggest fear was that my long hair would complain...but it works great on long hair. Great idea. The Go-Comb is one of those simple inventions that make you want to say..."Why the hell didn't I think of that???!!!". Works great. I purchased one of these for each of my sons. They fit nicely into their wallets. Not very flexible, so I do not believe it will get bent. Came in a little plastic sleeve. Bought a couple nore as a gimmicky stocking stuffer but was surprised to find the comb a useful, sturdy item that has in fact, replaced the plastic pocket comb. I bought it as a gift for my husband, as he uses those little brushes that fold up. Although he appreciated it, he says his hair handles brushing more than combing, so now it belongs to me. I was able to replace my too-long comb in my purse with this little wonder. I wish the one with the mirrored back had been available so I could have replaced another purse item. It is light and works smoothly in my fine, dense hair. Loved this! Very clever idea and great quality. Is small enough to fit in a credit card slot, but will do the job! I was constantly losing combs. With the Go-comb I don't even try to carry a comb, it is always in my wallet. Very cool invention. 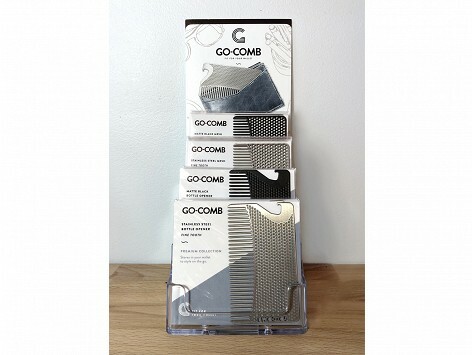 The Go-Comb is a thin, lightweight, metal comb, about the size of a credit card. 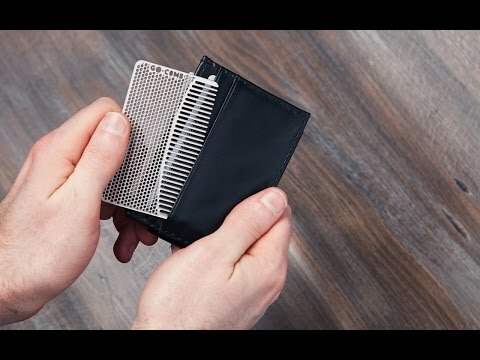 Made to slide easily into your billfold or pocket, this wallet comb keeps hair looking good when you need it, and stays out of your hair when you don’t. Which makes you wonder: why are regular combs so long? Brooklyn-based Maker Heather Burkman pondered that one night while out to dinner with her uncle. She watched him fix his hair with a traditional comb, then awkwardly put it in his wallet, half still hanging out. Heather didn’t see the need for all that extra comb.